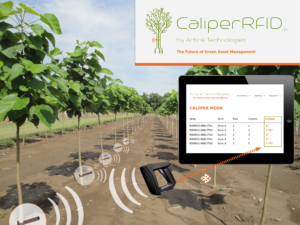 CaliperRFID is a revolutionary new product slated to automate the calipering process for tree nurseries. The band is specifically designed to expand with the tree as it grows. When the band is scanned with an RFID reader, the caliper is automatically stored in the Arbré Technologies inventory management system. It’s that easy. The product is intended to be cost-effective, UV resistant, and one-piece molded. Specific materials have yet to be determined but will most likely include a semi-rigid polypropylene mixture. Dimensions will vary based on nursery product sizes e.g. stock that will grow up to four inches in diameter prior to sale will require a band that is approximately 10 inches in length and two inches in width. 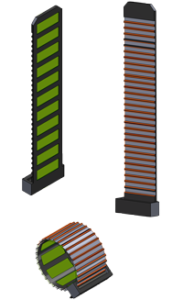 The device, roughly one-tenth of an inch in thickness, is ribbed to allow for airflow and to limit girdling, molding and any other adverse effects. The device resembles an over-sized cable tie; however, it allows for expansion and reduction at appropriate tensions instead of locking as a traditional cable tie would. It is attached as a traditional cable tie would be, although the company intends to develop an installation tool in the future. To secure your first order, contact us today.